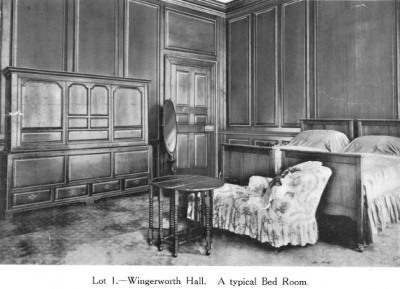 Wingerworth Hall interior is planned on a spacious but finely proportioned scale, with many beautiful ceilings, walls in panels with very handsome adornments and sculptured marble mantelpieces, whilst all the Principal Rooms on the Ground and First Floors are fitted with fine oak doors and old brass locks. 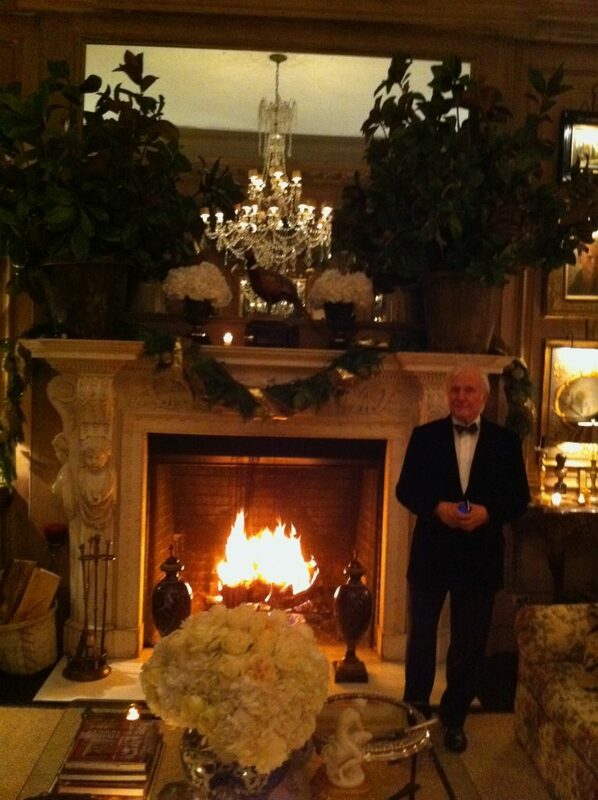 The Mansion is lighted by gas from the Chesterfield Gas Works and is partly wired for electric light. forms a perfect cube measuring 32-ft. each way, having its walls decorated with a scheme of massive fluted pilasters with Corinthian capitals and a niche for statuary, with an arcading of three arches opening to the Staircase Hall. The Doors have heavy cornices in high relief and there are moulded frames to the panels of the walls, with a finely enriches ceiling completing a beautiful apartment, which has also a heavy stone mantelpiece, oak floor, etc. 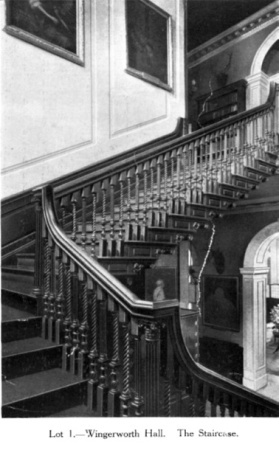 about 27-ft. by 15-ft., had a stone tesselated floor, the large panels of the walls having frames of sunk egg and tongue carved plaster with very fine Georgian dentil cornice of high-relief work and other characteristics of the period. The Oak Three-turn Staircase with heavy rail and graceful fluted and twisted balusters rises to a wide landing with an arcade protected by heavy stone balustrading overlooking the Saloon Hall. was about 16-ft. by 14-ft. 6-in. has oak panelled wainsot and doors throughout with a graceful Second Staircase rising to the First and Second Floors and is heated by hot water coils. has South and East aspects, is very beautifully proprtioned (about 28-ft. 6-in. 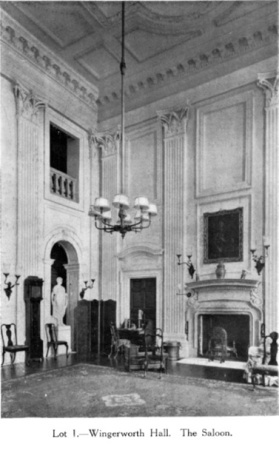 by 20-ft.), with walls completely panelled in oak to the ceiling with a dentil cornice and pilasters with Corinthian capitals, the large panels having moulded frames. The mantelpiece is of very fine statuary marble carved with cherub bust, jambs, etc., with a central carved tablet having a figure of Diana. The ceiling is of a fine Georgian design. see below for an update on this room. about 23-ft. 6-in. 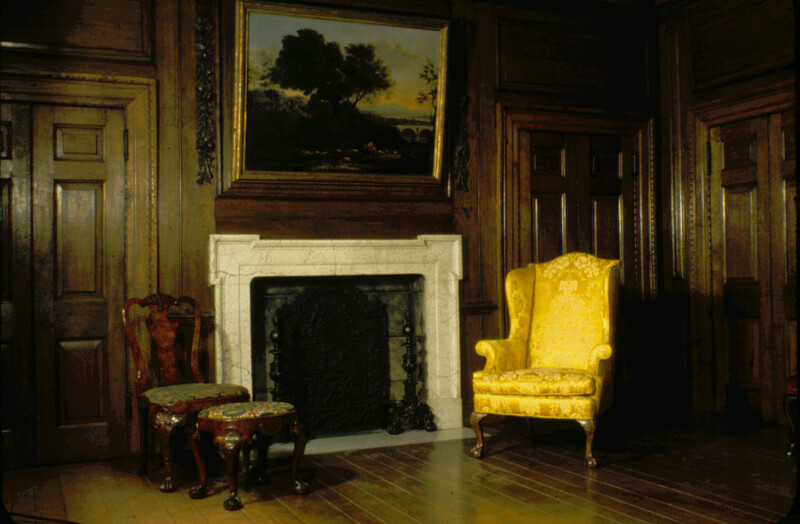 by 20-ft., is also finely panelled in oak, with a glazed doorway opening to steps leading to the South lawns. 29-ft. by 20-ft., is a beautifully proportioned apartment with a handsome statuary marble mantelpiece, inlaid with coloured marbles. There is a coved cornice and quaint ball pilaster frieze. 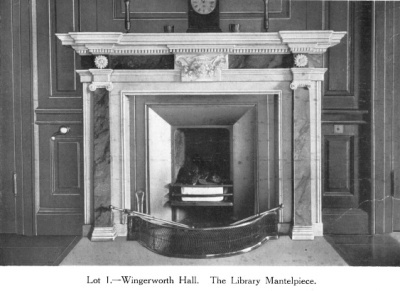 has lofty oak panelled walls on two sides, with dentil and moulded oak cornice and light Georgian ceiling. There is a handsome Adam statuary marble mantelpiece with Sienna marble jambs, Ionic capitals and facings. South and West aspects. is an L shaped room, about 1 i-ft. by 20-ft. and 20-ft., with panelled walls, two lavatory hand basins with hot and cold water, separate W.C., etc. about 30-ft. by 20-ft. 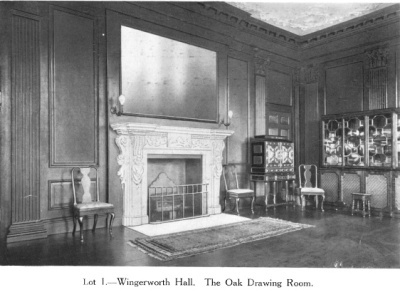 6-in., is completely panelled in old oak with a heavy moulded marble mantelpiece and oak cornice, and affords pleasant prospects to the West. adjoining the North Hall, with lavatory basin (h. and c), and a separate W.C.
comprise Kitchen with closed range ; Scullery and Pantry with hot and cold water; Housekeeper’s Room, Larder; and there are also in the well-lighted lower Ground Floor, Butler’s Pantry and Servant’s Hall, Knife-cleaning and Brushing Room, with glazed sink; Large Room, formerly Kitchen, taking two or three beds for men, Wine Cellars, &c. There is a Service Lift, and a Spiral Stone Staircase communicating with all floors. are lofty and well-proportioned and very handsome apartments, many being panelled in Oak to their ceilings and having suitable grates with Georgian mantelpieces in character, and tasteful Georgian ceilings. On the First Floor are Five Spacious Double Rooms, Three Dressing Rooms, Two Bath Rooms, with hot and cold water and tiled walls, W.C.’s, &c.
On the Second Floor are Six Large Double Rooms and Eight Single Rooms, Two Bathrooms, with hot and cold water and lavatory hand basins, housemaid’s sink, &c, cupboard, W.C., making a total of 22 Bed and Dressing Rooms (besides Men-servants’ Rooms). The floors are mostly of oak, and the doors are of panelled oak with old brass locks. There are Seven extra Rooms, together with W.C. and an old Bath Room, in the North-Western Annexe now occupied by menservants, but which could be utilized for any purposes desired. The South-Western Annexe is a very substantial block of buildings, comprising An Orangery Laundry, Dairy, &c, with Two Large Rooms (separately approached) over, now utilized as The Estate Office. 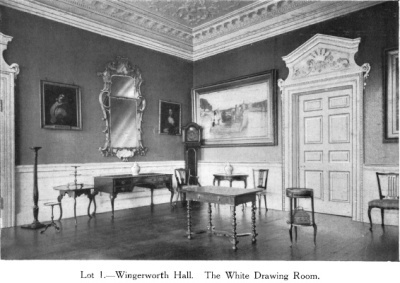 Many of the objects in the room were not originally from Wingerworth Hall, but were placed there as a semblance of what an English Room might look like. 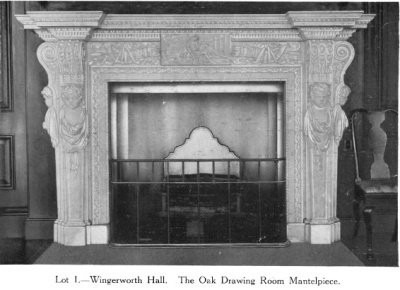 The only object still in the collection of the Saint Louis Art Museum from Wingerworth Hall is the mantel of the fireplace. 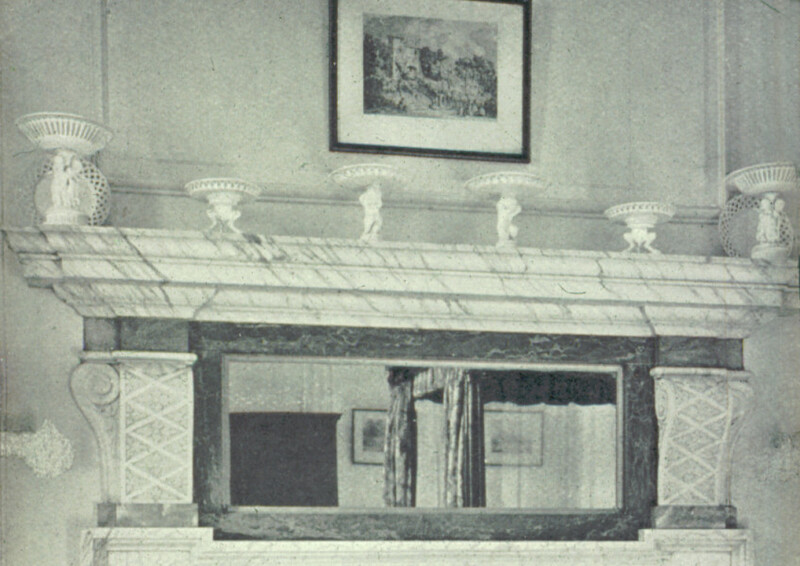 The fireplace appears to be from a bedroom as the mirrored section in it reflects what appears to be a four-poster bed. All the other objects have been de-accessioned. 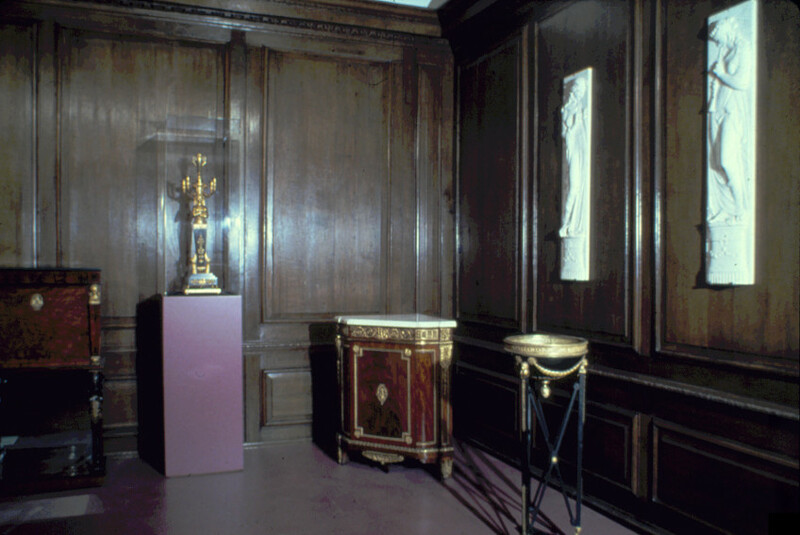 The room was removed when the galleries were renovated in the mid-1980s. in 2017 Kev Knight eventually managed to contact Joe Minton who now owns items from the sale – specifically The Oak Room. ROOMS, pages 8 & 9.
and shipped to California for use in his estate at San Simeon. furniture was included in any of these sales.